… and I should like to fix it. (That’s a phrase straight out of a 1970’s Hungarian/English phrase book; in the Socialising/Dating section). But sadly, I don’t know how. I have tried. I asked Reg (his real name) to fetch his implausibly big digger and help me. He dumped a huge digger bucket of wet clay on what we thought was the site of the leak. It’s great being able to call on Reg. As long as the ground is firm enough to support the enormous weight of his almighty digger, he can trundle into the Priory grounds and scoop out mud and oozy stinky stuff from the pond margins and ditches. He can take away piles of waste soil (a by-product of having loads of new brick paving laid) and spread it on Margaret’s fields. He can even dig new ditches – and has. It’s like having a huge Tonka toy to play with. Or having a hotline to International Rescue (Gardening Division). 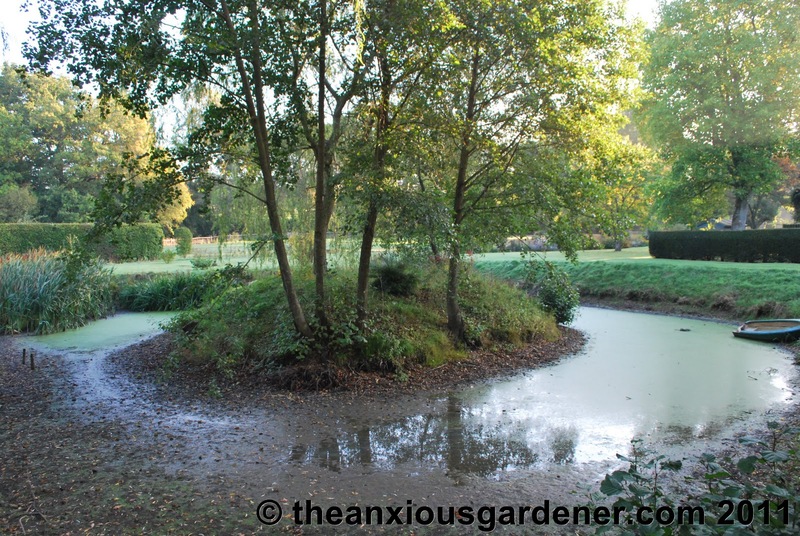 And he can dump great dollops of wet clay on a suspected pond-leak – but it didn’t work. The lowest water level I’ve seen in the west pond. Hardly a water level at all, actually. Not so much a pond then as a sludge. The West Sludge. Still, I should be able to get over to the island without having to tug on my waders. “Soon, I will pull on my wellington boots and strim my island.” That’s in the phrase book too. It is, undoubtedly, curmudgeonly to wish for rain but – I wish for rain. There I’ve said it. A lot of rain. I need days of rain. 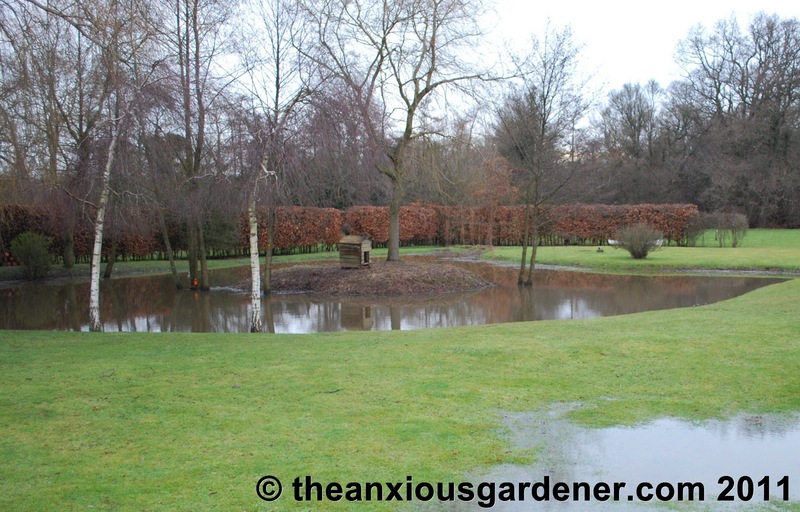 It is only after a deluge that water pours into the Priory gardens from the surrounding fields. Only when those fields are saturated does water pour into the east pond, and then, when that’s full, it pours into the ditch and then it pours into the west pond – until it’s brimming. It will be really, really full for a while and I shall be pleased. 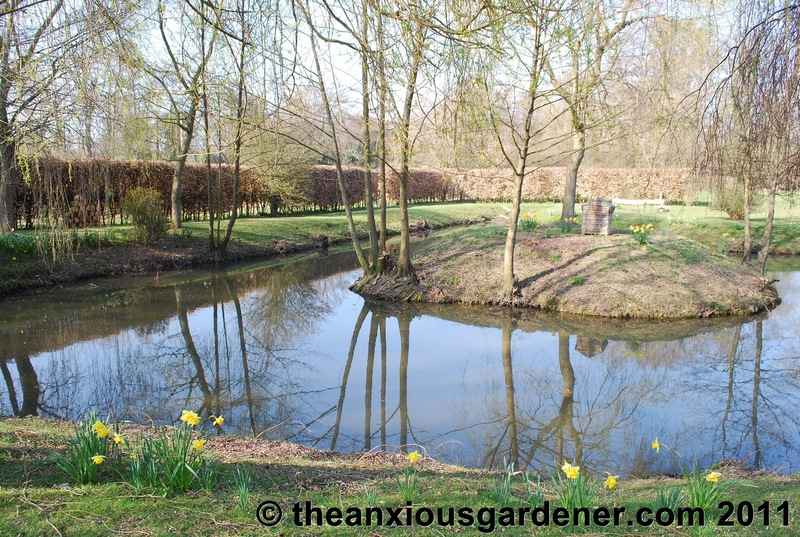 But, it will start to seep away again because my pond leaks and I should like to fix it. Next time I'm in a bar in Budapest, Stacy, we'll find out! As for sheep and pig pond-kneading techniques. Straying beyond my knowledge base, just a bit. Sheep were used up on the Downs because they were/are the only animals that are generally grazed there. Does that sound plausible? Let's stick with that then! I'm more interested in knowing how that all went over in Hungary. Do sheep and pigs actually have different pond-kneading techniques?? Doh! Dontcha just hate it when someone calls your bluff, Janet? I would take you up on your very kind offer 'cept my agent always says, “never work with beagles, meerkats or anyone wearing tulip adorned wellies – especially the latter.” Sorry, my hands are tied – she's very strict! My wellies have tulips on them, so I think I'll look pretty cool jumping up and down in your pond. What's the full address? 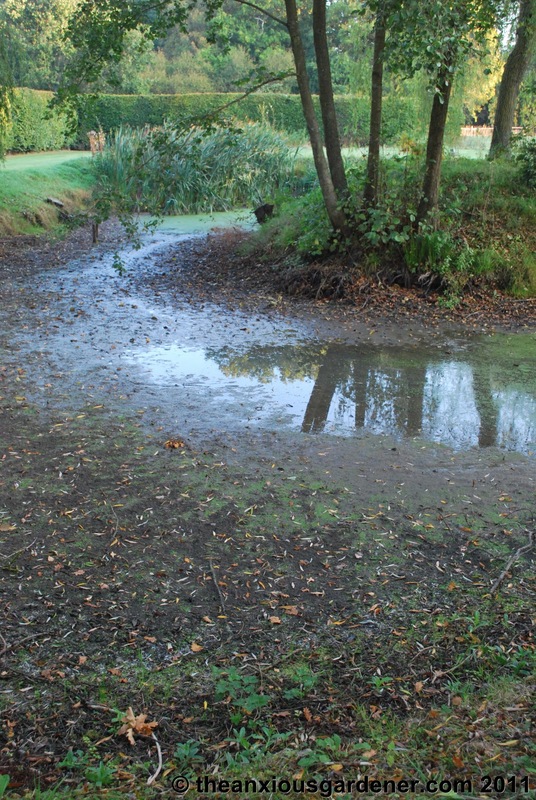 Hi Helen, certainly dew ponds on the South Downs were made with a lining of clay that was 'kneaded into position by livestock. I did trample the clay plug that Reg put in place but obviously to no affect whatsoever! I think Janet, that you're trying to make me look like a buffoon (as if I need help with that). I'll tug on my wellies, march up and down the pond, even sing and dance, if YOU join me. Hmm, you seem to have come over all quiet. Hehe. I like Helen's idea. In the absence of livestock, perhaps you in your wellies could trample up and down on the new clay, perhaps whilst singing. Oooh, ooh, I know, kill two birds with one stone, do a rain dance on the new clay patch! Seriously though, very frustrating to have a slow leak. I read somewhere that you needed to have livestock walk over the clay to paddle it down – cant remember if it was sheep or pigs. Otherwise it isnt compacted enough and cracks appear. Mr Faisal, the water leeks out to the river, I think, 60 or 70 yards away. The dog kennel is where we house the Priory Hound. He's released out into the surrounding countryside every couple of days to hunt. We don't know what he eats but he always comes back sated. Or … the other answer is that it was an old, badly made duck house – broken up by me long ago for firewood. Nice that you feel sorry for him, Alberto but try and pet the Priory Hound and he'd have your arm off. No crocs required. 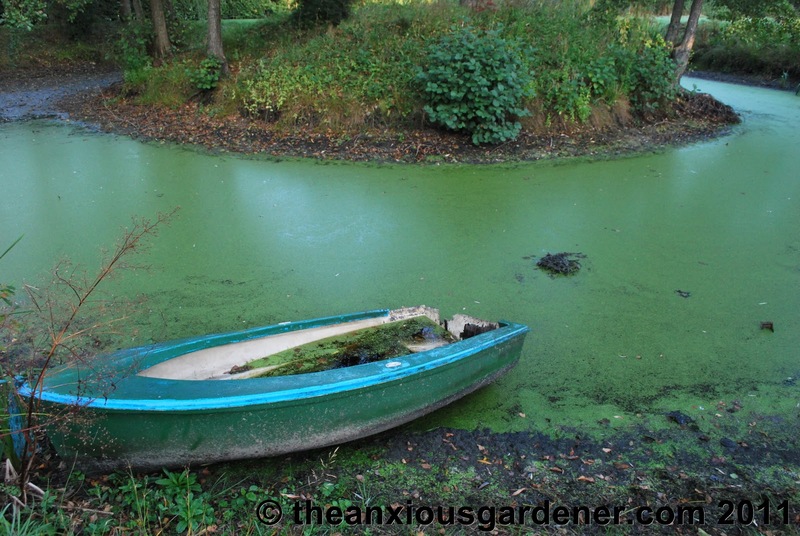 Mr K, you've bought a cold and cruel smile to my lips at the thought of what is happening to the duckweed. Hmm, you're right about the Despondent. We're going to need a bigger boat! (Sorry to hear about your primulas – a sad tale). Hi Luton Boys, after a dry summer it does get very low. But it should soon refill and remain mostly so till next late summer. We may have to get an engineer in to see whether the problem is solvable. Hi Petra, thanks for profound sympathy. I think we'll just live with an occasionally low water level. Certainly wouldn't lose one of the ponds. Oh no!! Am so sorry about that. No knowledge to share as to ponds, only profound sympathy. Will you try to get it sorted or turn it into something else? Oh dear, what can I say? You may possibly need to seek structural/ground advice? Is this a recurring problem in the priory or has this happened many time before? I'm curious now why this happens. Hope it gets sorted someday, cross fingers! Speaking as someone whose pond has just overflowed and drowned my primulas, thanks to ceaseless rain, I commend you to look on the bright side and contemplate the likely fate of the duckweed. If Alberto is right about the crocodiles, you need a stronger boat. That's a nasty bite something has taken out of the stern..
Yeah, I'm very sorry for your pond but I feel even more sorry for the poor animal you are segregating in the little island… Do you keep crocs around it too? A bit of a blow, Dave, when everything else looks so well-tended. Where would the leak go to, or does the leaking water just drift off surreptitiously? Can I ask what a dog kennel is doing on the island?